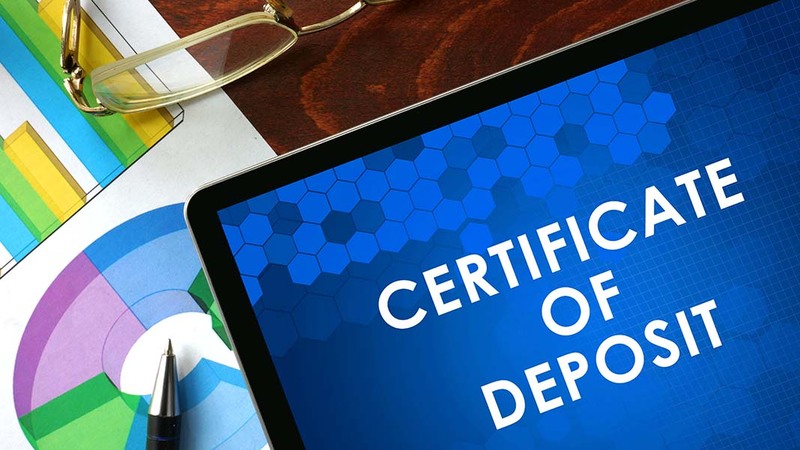 A certificate of deposit (CD) is a federally insured savings account that has a fixed interest rate. Typically interest rates on CD accounts are higher than a savings account, which means you’ll make more money. What’s different about a CD is that there’s a fixed date in which you can withdrawal the funds, also known as the maturity date. Are you interested in growing your savings and want to learn more? Keep reading to learn about the ins and outs of CDs and how to best use them to better your investment portfolio. If you’re new to investing, it’s easy to confuse a CD with a savings account. While a CD, in essence, acts as a savings account, it is a bit different than a traditional savings account. With a savings account, you can deposit and withdraw funds by visiting your local bank branch or going to an ATM. But CDs require that you leave your money in the bank for the term length. Touching the funds in a CD requires you to pay a penalty fee. So how long does your money have to sit in a CD before you can withdraw? Term lengths depend on the bank that you choose and the CD agreement. Some banks offer term lengths as short as a few days. On the other hand, there are some terms that can last as long as 10 years. Most people opt for a term length between three months to five years. Though it may be hard to put your money into an account that you can’t touch for months, the benefits are well worth it. Typically a longer term length means that you’ll earn a higher interest rate. In fact, some of the most popular five-year CDs offer APY rates above 3%. What’s even better is that the APY rate is fixed, so your annual percentage yields are locked in for the term length. When compared to a traditional savings account, putting your money into a CD will net you much more interest growth in the long run. Is a CD Right for Me? While a CD has its benefits, it may or may not be the best investment choice for your financial needs and goals. If you don’t need immediate access to the money you’re saving, then you’ll want to choose a CD over a savings account. With the right CD, you can earn double what you’d make in five years with a savings account. Not a fan of putting your money away for years? You can choose a high-yield six month CD that doesn’t require you to wait as long until you can access your funds. You can find six month CD APYs as high as 2.50%. Be aware that withdrawing money before the CD matures often results in a hefty penalty. You can expect to lose several months’ worth of accrued interest if you withdraw funds early. If there’s any chance that you need the money you’re saving for an emergency, it’s best to stick with a high-yield savings account. This way you can access those funds without penalty. Depending on your cash flow, you may find it ideal to have both a savings account (for emergencies) and a CD. Just as there are thousands of banks that offer checking and savings accounts, these same banks typically also offer CDs. While you may be tempted to open a CD with a bank that you’re familiar with, you may not be getting the best deal. One of the first things to look at when choosing where to open a CD is the interest rate. Obviously the higher the interest rate, the more money you will make. One option is to look at online banking. For example, CIT Bank offers a term CD with an APY up to 2.50%. You can read professional reviews of CIT Bank and others to get an idea of how digital banking and lending work. Another factor to be aware of is any minimum deposit requirements. Some CDs require $1,000 to $5,000 to be deposited into the account immediately. If you don’t have a lot of money to put away, you’ll want to look around for a bank that offers a low minimum deposit requirement. By taking the time to research banks and CD terms, you can ensure that you’re making the right financial investment decision that will serve you well now and into the future. A CD is a great way to earn money on saved funds. But before putting your hard earned money into a CD, be sure that it’s the option that best meets your money needs and goals. Alex Coverdale is an Internet marketer from the UK and helps run the Link Kings Agency network along with the link-kings.com website.